The solar eclipse happening on August 21, 2017 will create unique economic, social, and educational opportunities across the U.S. Over 12 million live in the path of the eclipse, and up to 8 million more will visit the narrow band across the midsection of the country. People who witness the total eclipse will experience something hasn’t happened in the U.S. for over a century. Communities across the nation are preparing for the crowds and the economic opportunity that accompanies so many tourists. A total solar eclipse is an incredibly exciting event, but it wasn’t always this way. Eclipses were once considered bad omens, signs of angry gods, or indications of impending doom. Early cultures learned to read the sky as a calendar to tell them when the seasons would change, when the animals would migrate. People learned to use the sun and stars to find their way in the world. When people noticed the patterns and relationship between the objects in the sky and the seasonal events on earth, they concluded that these signs must be intended for them. So when an event like a solar eclipse disrupted the orderly pattern in the sky, they assumed that this too was a message for them. Most times they concluded that the news was not good. The effects of this association between events above and problems here on earth linger in our language even today. The word “disaster” comes from the Greek for “bad star”. This association is completely understandable – there was nothing else that could explain what these people saw in the sky. This was, of course, long before anyone suspected that earth is just one of innumerable objects moving through a vast universe. Many of our ancestors saw eclipses as a time when animals or demons tried to eat the sun. In fact, the earliest word in Chinese for eclipse, means “to eat”. 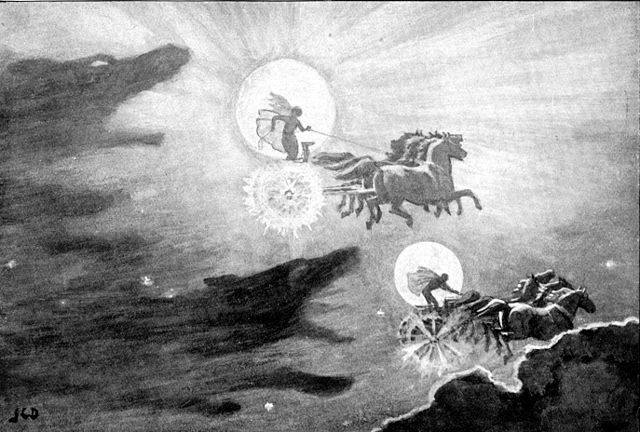 The Vikings believed that wolves chased the sun and moon in the sky, and caused an eclipse when they caught them. In Vietnam, it’s a toad that seeks to eat the sun. The Hindu learn that the demon Rahu planned to steal an elixir that granted immortality. But the sun and moon discovered his plot, and reported it to the Hindu god Vishnu, who sliced off Rahu’s head before he could fully swallow the elixir. Rahu’s head became immortal, but his body died. The demon’s head forever travels the sky seeking his revenge on the sun and moon. But even if he catches and eats them, the sun and moon fall out of the bottom of his head, since he no longer has a body. Many other cultures have similar stories about eclipses, but of course we know now that the upcoming eclipse is simply the shadow cast by the moon as it passes in front of the sun. Eclipses, however, continue to have a profound effect on our cultures, as they provide an opportunity to experience the universe up close. If you have a chance to see the eclipse, I encourage you to take it, and imagine what our ancestors must have thought as day turns to night. For more information on the science behind the upcoming solar eclipse see the informative video from Vox below.